If you’ve ever wished you could skip the swipe/match/message part, and just conjure up a date for Friday night with the ease of ordering an Uber, Clover is the app for you. From cost to a break down of what you can (and can’t) do for free, this in-depth Clover dating app review has everything you want to know – including how it stacks up to Tinder. Here’s a quick overview of each one. This is where you’ll see your potential matches, called “Prospects”. Free users have two options: tapping the blue X or the red heart. If both people express interest, a match is formed and you can start messaging. Clover Premium users don’t have to wait for a mutual match, they can tap the green thought bubble and initiate a message exchange right away. Perhaps one of Clover’s most popular features, this section is where you can see all the people who are looking for dates. Scroll through all the options, tapping “I’m Interested” or “No Thanks” as you go. If you’re interested, you can suggest a place and time, or let the other person do it. Choosing a venue is easy thanks to a pull down list of options, or you can add a custom location. Tap “send” and your date suggestion will be sent to the other person, and you’ll be notified if they confirm it. 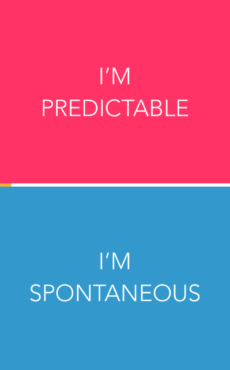 If you opted for the other person to take the lead on planning, you’ll have the option to confirm their choice. You can keep track of your unconfirmed dates in the “Pending” section, and scheduled dates in the “Confirmed” section. When you see one that interests you, you can join it, see who the other attendees are, invite other people, and exchange messages with other mixer members. 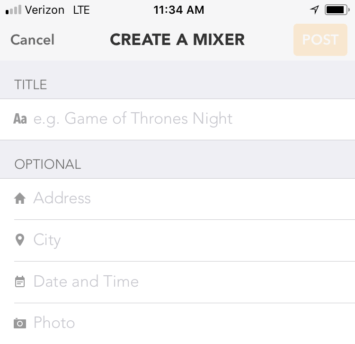 To create a mixer of your own, tap the blue + icon at the top right of the screen, fill out the details, and post it. 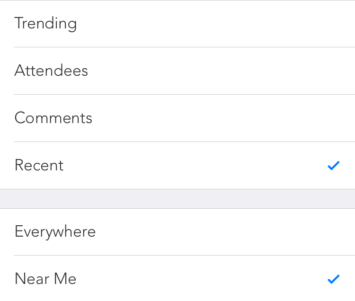 You can keep track of your mixers in the “Invited” and “Attending” sections. 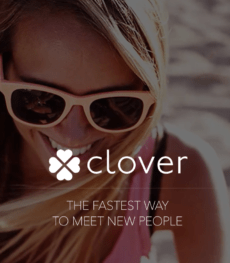 Like most dating apps, Clover makes signing up easy by connecting to your Facebook account. 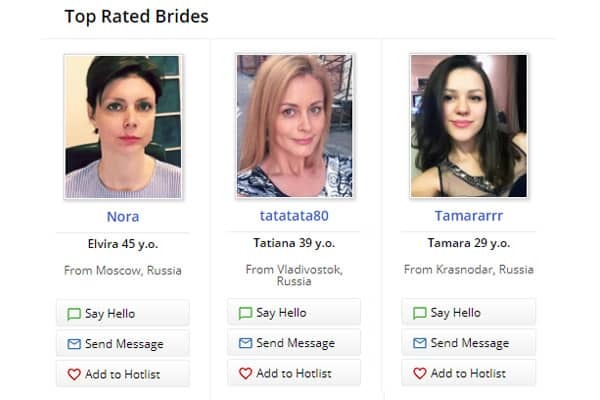 You can also sign up using your email address and password, which makes Clover a viable option if you’re looking for a dating app that doesn’t require Facebook. Start by choosing your photos (up to 100), entering your first name, and filling out all the usual biographical data like age, gender, intention, height, etc. You can then choose to start a 7-day free trial of Clover Premium, or just start using the app for free. While Clover Premium has some nice perks, like not having to wait for a mutual match to message someone who interests you, it’s still a functional dating app for free users. Clover Premium costs $39.99 a month, with the price going down if you commit to a longer time up front. Advanced search filters like intention, height, income etc. Sort your prospects (matches) by age, income, location, online, etc. You can also purchase boosts to give your profile more exposure. You can buy 1 boost for $2.99, 5 for $2.59 each, or 10 for $1.99 each. To finish setting up your profile, simply tap “view or edit profile.” You can fill out the 200-character-or-less “About Me” section, and add personal details like your relationship status, hair and eye color, body type, income, religion, etc. 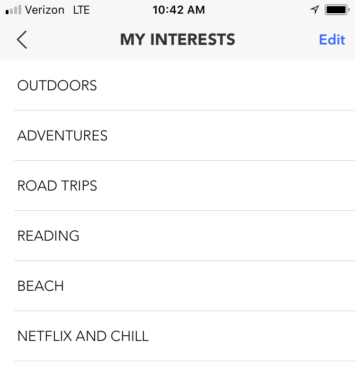 You can “Add Interests” like food, outdoors, animals, cuddling, etc… by selecting options from a menu, and link your social media accounts to your profile. 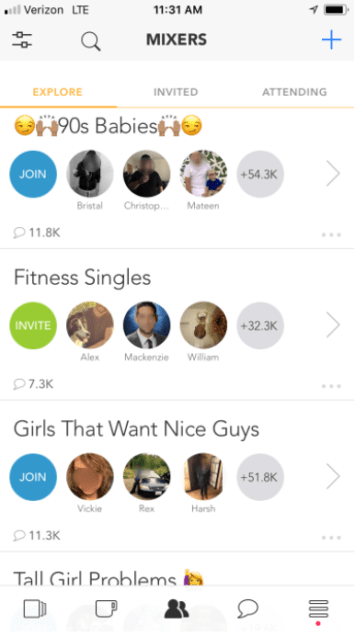 Since potential matches can filter by common interests, it’s a good idea to choose some now. There’s also a “20 Questions” section that will help the app find your most compatible matches. It’s a simple game where you’re presented with two options, like “I prefer intelligence/I prefer good looks.” Answering all 20 questions earns you the “open book” badge. Badges are displayed on your profile, and are earned during the course of using the app. Other badges include “irresistible,” “celebrity,” and “desirable”. Badges can be earned by doing things like using the app between 10 pm and 6 am, getting liked by 100 people, or making 5 people laugh in a chat. While the badges may seem slightly cheesy to some, having them displayed on your profile is a good indicator you’re actively using the app. 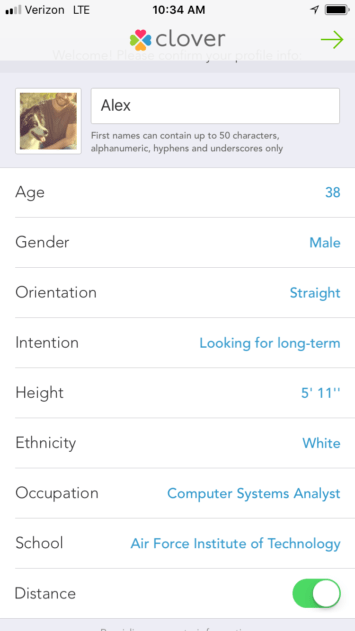 Clover allows you to get hyper-specific about what you’re looking for, although you need a paid subscription to filter beyond the basics of gender/orientation, age, location and distance. If you’re looking for “The One”, and you don’t mind limiting your match pool by screening for dealbreakers like kids, smoking, drugs, etc., paying for Clover Premium could be a wise investment as you’ll only see profiles of people whom you’d actually consider dating. You can also swipe through matches in any city you want, similar to Tinder’s Passport feature. 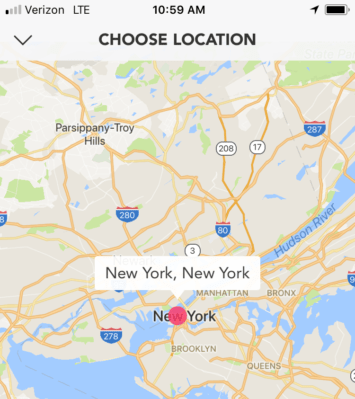 Unlike on Tinder, you don’t need a paid subscription to change your location on Clover. It does, however, display how many miles you are away from your matches. You can review all your matches in the “Prospects” section, as well as see who you liked, who you passed on, and who likes you. If you see someone there that interests you, tap the “heart” icon and you’ll be able to begin a message exchange. Tinder has a clear edge over Clover when it comes to sheer numbers of users, as it’s one of the most popular dating apps in the US. You’ll find people looking for a range of relationships on both Tinder and Clover, but you can sort your matches by “Intention” on Clover. Clover’s On Demand Dating feature could also make hooking up a little easier, since you can skip the “getting to know you” messages and go straight to suggesting a date. 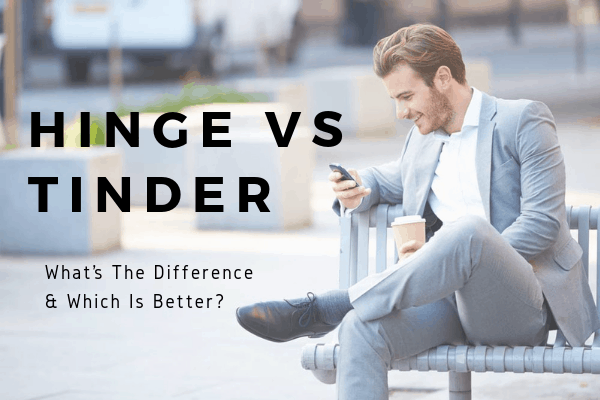 Whether you stick with Tinder or give Clover a try, you still have to spend hours scrolling through profiles, sending messages, and (hopefully) scheduling dates. Why not save yourself some time and frustration, and let VIDA’s team of dating experts handle everything for you? 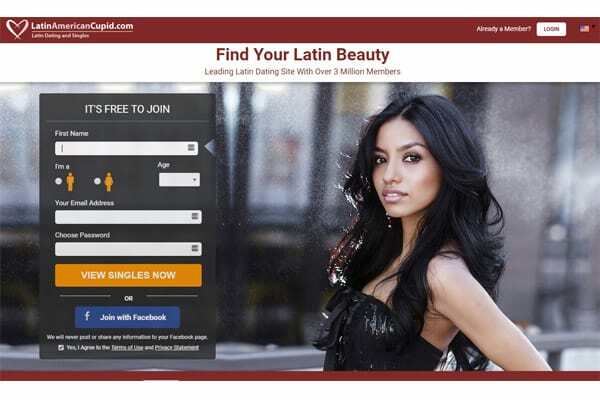 Profile creation, messaging, even setting up dates – we do it all, on any site or app you want to use. Finding your ideal partner is a lot easier with VIDA on your team, and on average our clients meet that special someone within the first 3 months of service!